Say goodbye to Google's notification center and voice search, at least in the Chrome browser. Google’s choice to eliminate voice search and a notifications center from its latest Chrome browser probably means one of two things for PC users: either Microsoft’s own Windows 10 features have won, or Microsoft never should have added them in the first place. Google’s Chrome 46 eliminates the notification center Google installed in the browser beginning in 2013, simply because users never actually used it. And VentureBeat noticed that Chrome for Windows has done away with the “OK Google” voice trigger, which allowed users to search by voice within the browser. That’s interesting, because both features have been built into Windows 10. In the taskbar's system tray, a new Action Center archives all sorts of things, including email, calendar reminders, and more. And provided Cortana is enabled and the PC includes a decent microphone, users can either say “Hey Cortana” or tap the mic button to trigger a search, set a reminder, or more. A Google Chrome notification from Slack. Why this matters: What Google does shouldn’t affect Microsoft directly. But it’s an interesting indication that consumers may not be warming to two features Microsoft touted as among the selling points of Windows 10. There’s also one relevant anecdote: a year or so back, I visited the offices of Nuance Communications, the developer of the Dragon series of dictation software products. I expected office users to be chattering away, orally dictating documents and commands. Nope—it was quiet as any other office. However, Google hasn’t eliminated notifications and voice search entirely from Chrome—it’s just that they require a bit more effort to use. For one thing, Chrome will still allow a website to send notifications to your browser, such as Slack. The notifications slide in from the lower right, as usual. It’s just that now, if you miss them, Google won’t have a repository where you can catch up whatever you missed. 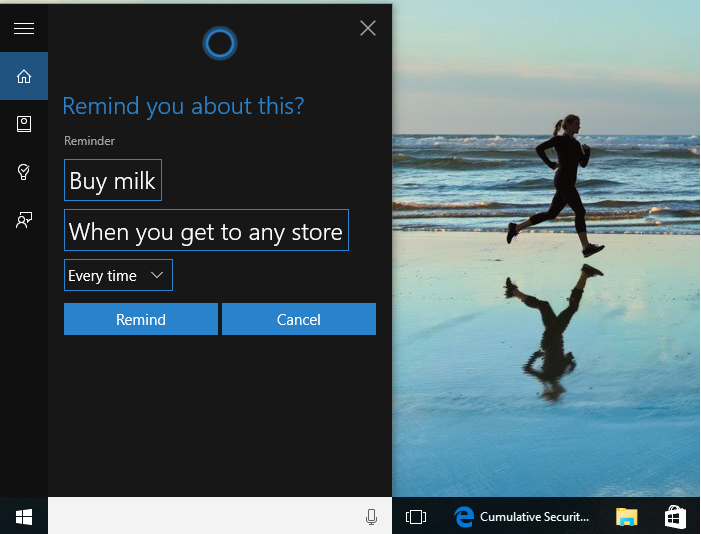 One of the nicer features of Windows 10 s the abillity to dictate reminders to Cortana while doing something else. But are users actually doing so? Google presumably could integrate those notifications with the notifications centers built into Windows 10 and Mac OS X, although the company hasn’t said whether or not it will. An email asking for comment was not immediately returned. Likewise, users can still search via voice by visiting the Google.com page and clicking the mic button. (Previously, voice search would work on almost any page, provided that Google was your search provider.) Users can also orally search via their phones, and notifications will slide in on Android phones as they normally do. And if you use a Chromebook powered by Google’s Chrome OS, none of these changes should affect you: you’ll still see the notifications center and have access to voice search. Still, we’ve asked Microsoft for comment on how Google’s decisions will affect Windows 10 users. Do you search orally via Cortana on your PC? How often do you look at the notifications center on Windows 10—or did, in Chrome? Tell us in the comments.